As a typology conceived in the twentieth century, the office building is often the architectural manifestation – not only of global capital, but also of technological might and mass production. But when we think of these buildings, we often think more of objects than of space; more of appearance than of atmosphere. In A-Typical Plan, Jeannette Kuo offers a reversal of the experience, starting from the inside out, and prioritizing space over symbol. In particular, the book reconsiders the deep plan within the European context for a discussion on density, economy and, not least, sustainability. Featuring buildings by architects such as Frank Lloyd Wright, Kenzo Tange, Giuseppe Terragni, Le Corbusier, SANAA, Herzog & de Meuron, Toyo Ito, Christian Kerez, and many others, A-Typical Plan presents a collection of projects through history that have attempted to bring character to the deep plan as a spatial experience for the workspace. 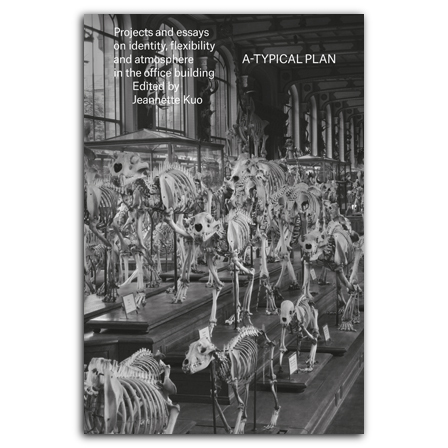 The work features essays by renowned authors, including Iñaki Ábalos, Pier Vittorio Aureli, Andrea Bassi, Florian Idenburg, Jeannette Kuo, Freek Persyn, and a reprint of Rem Koolhaas's text "Typical Plan" of 1995. A conversation with Inès Lamunière and a graphic essay by Jimenez Lai round out the diverse perspectives. A final chapter presents the work of students at the EPFL, with whom this research began. Succinct and beautifully illustrated, A-Typical Plan is a reminder that even buildings created for quotidian uses can be spatially and experientially rich. Named one of 2013’s Most Beautiful Swiss Books. Designed by Samuel Bänziger, Bänziger Hug GmbH. is an architect and co-founder of BassiCarella architectes in Geneva. He also teaches as a professor at the École Polytechnique Fédérale de Lausanne's School of Architecture. is a founding partner of Karamuk*Kuo Architects in Zürich. She studied at U.C. Berkeley, Harvard Graduate School of Design, and ETH Zurich. She is currently also Assistant Professor-in-Practice at Harvard GSD and has taught as a visiting professor at EPFL's School of Architecture 2011–14. is the leader of Chicago-based Bureau Spectacular. He is currently also an assistant professor at the University of Illinois at Chicago. co-founded Devanthéry & Lamunière architectes in Geneva in 1983. She has also been teaching as a professor at the School of Architecture of ETH Zurich (1991–94) and of Ecole Polytéchnique Fédérale de Lausanne since 1994.
is co-founded 51N4E architectural practice in Brussels. He has also been an assistant professor at the Faculty of Architecture at the University of Ghent, visiting critic and studio master at the Berlage Institute in Rotterdam, and visiting professor at the Academy of Architecture in Mendrisio.